The Virginia Department for Aging and Rehabilitative Services (VA DARS), in collaboration with community partners, provides and advocates for resources and services to improve the employment, quality of life, security, and independence of older Virginians, Virginians with disabilities, and their families. Read about our mission statement and our code of ethics. 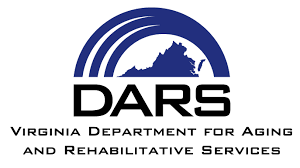 DARS includes the Adult Protective Services Division, the Community Based Services Division, Disability Determination Services, the Division for Rehabilitative Services, the Division for the Aging, Wilson Workforce and Rehabilitation Center, the Office of Community Integration and the Office of the State Long-Term Care Ombudsman. The Division of Rehabilitative Services offers vocational rehabilitation to assist people with disabilities to prepare for, secure, retain or regain employment. An individual may be eligible for these services if he/she has a physical, mental or emotional disability; this disability keeps the individual from working; and he/she lives, works or attends school in Virginia. DRS certifies that there is a good chance that these services will result in employment. Vocational rehabilitation counselors may provide or assist with: physical and mental restoration; vocational evaluation/career exploration; vocational/job training; job placement assistance; situational assessment; and job development/job coaching.